How disappointing. It did look nice in the photo. Luckily (considering my budget) caviar is something I can pass up quite easily. What the heck is the point of caviar that doesn’t pop? That’s the whole point! I held off on trying Onuga, but weakened the other day in the face of a distinct lack of any alternatives on the shelves (even lumpfish roe). What a mistake. I found it nasty in texture, and insipidly lacking in flavour. What flavour there is is not unpleasant, but I’d rather just grill a herring. I am appalled by the prospect of the same people’s ‘Salmuga’ and ‘Troutuga’ as mentioned on their website. 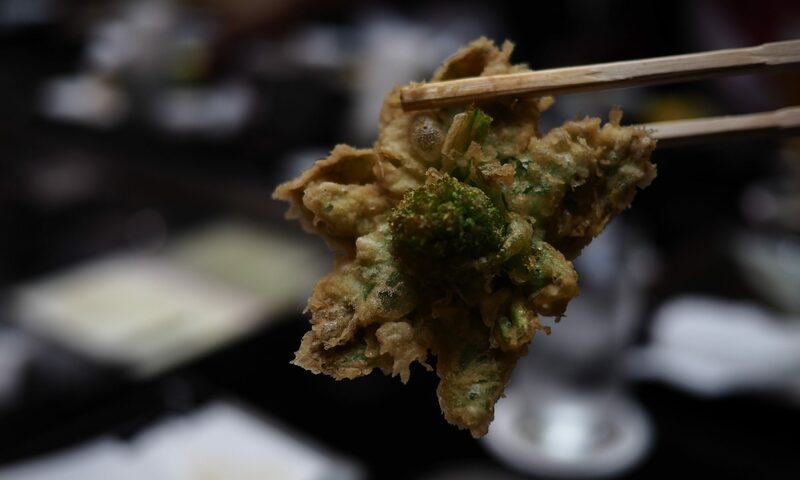 How does onuga compare with lumpfish roe? I quite like lumpfish roe. And it’s cheaper than onuga. 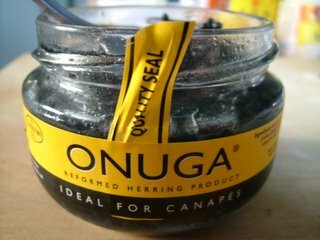 I have never purchased onuga, since put off by the text ‘reformed herring product’. Your review suggests that I should not re-assess my position. Stick with the lumpfish. It tastes better, it’s cheaper and the texture is better (in that it pops rather than glueing itself blackly in crevices between your teeth). 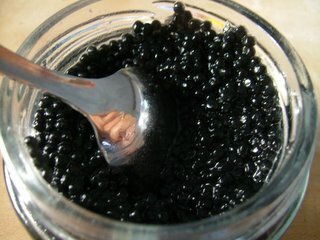 The “Food Programme” on radio 4, 12 february 2006 discussed caviar and mentioned onuga. They conducted a taste test (caviar vs. onuga), but nobody said yeuch about the onuga. Probably too polite – i have greater confidence in your comments. Thanks for your comments on lumpfish roe vs. onuga. I saw this in tesco, looked promising for an attempt at making my own Gunken Sushi. Having never tried caviar or any roe product, I’m glad I wasn’t disappointed by a poor fake. I bought the same little jar of Onuga (£3.99) from Sainsbury's..being completely over the moon that I finally found this precious little jar of black jewels..
Well, it turned out to be fake! My wife and I have bought this a few times now. We don't know what you are all fussing about. It tastes fine the texture is great and it's perfect with vodka and blinis. I saw it on the shelf in Sainsbury and wondered what it was, bought it. It was Christmas time,so I splashed out. 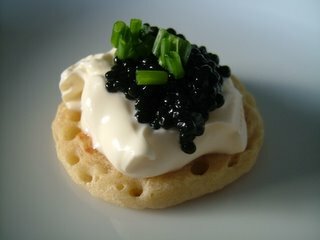 I never experienced caviar, therefore I found it most delicious. I will treat myself to a jar from time to time, especially when I suffer from lack of appetite,this does go down very well indeed. Previous PostPrevious Wild carrot – and violets in November!